If you try to plant too many things, you will be defeated. But if you start with one or maybe three things that you simply must grow for they cannot be purchased to perfection like you could grow them, then you will not only survive, you will thrive. And since you are only really counting on those one-to-three things, since they are getting all your love, you’ll end up realizing, Well, I could probably tuck a basil plant here since I am here frequently, and maybe a few radishes under the shade of the zucchini leaves. And soon you’ll be companion planting and actually doing more than you thought. But if you go to the store and buy 37 packages of seeds, you are doomed. Doomed. I started out gardening with ZERO experience in 1997. I am a city girl with a farmer’s heart – except that they have to pretty much work the farm 24/7 365 days a year and I am not quite that committed. I decided on tomatoes. My Aunt Rosie always served us home grown tomatoes fresh from her garden and regardless of whatever else was served, they were like having the best Texas steak you have ever seen on your plate. So when I decided to do it, I actually went to the library and checked out about 17 veggie garden books and one wholly devoted to tomatoes and read and read and read. The author of the tomato book basically said, “If you’re going to grow tomatoes, you should grow the best ones on the block. Do not go into it half-heartedly. Do everything possible to have the sweetest, biggest, most amazing tomatoes anyone has ever seen.” So, as a tribute to all the books I’d read about them, I actually planted about 17 tomatoes plants and they were the BEST tomatoes I had ever seen in my life! Now-the neighbors and everyone I knew dreaded seeing me coming, but I kept everyone I knew fully tomato’ed! Zucchini and yellow squash are great to grow for grilling. But they take a lot of room. I grow them mainly because I can feel haughty when I am in the store and they are selling for $1.00 each and I have just picked 7 or 8 of them for dinner. ALWAYS pick them young, slice in thick on the diagonal, toss them in extra-virgin olive oil, season and grill. You get great grill marks and they are delectable! Peas are the gardener’s candy. Sugar snap peas are wonderful because you can eat the whole pod or not, as you wish. Great stir-fry. Very sweet. The grandbabies and I snack while we work! Radishes. Don’t try these in the heat of summer. They get too hot. But they grow quickly and are very fresh and crisp early. Plant them outside now if you want. Beans are easy. Every kindergartener starts out this way. Peppers are great. They are pretty plants, too, so they make a great potted plant and there are just so many varieties you can’t get in the store. I also like lettuces, and sometimes okra and the eggplant is so pretty (but I always forget how to fix them). So many directions a person could go. And don’t forget to tuck in some marigolds and nasturtiums while you’re at it. They’re edible, add some beautiful color and keep the icky bugs away to boot! But there I go again – telling you too many things at once. So, if I could only plant one thing, it would be tomatoes. Those transparent-barely-pink things on your fast food burgers are NOT tomatoes. Late summer, you can find some great tomatoes at the farmer’s market, but there is nothing, I mean nothing, like growing your own. They are worth the effort, the babying, the prep, the watching, the watering and weeding! And if you can grow the tomato, which is THE most wondrous thing, you can now grow anything! Good times! I Corinthians 15.35b The Message: We do have a parallel experience in gardening. You plant a “dead” seed; soon there is a flourishing plant. There is no visual likeness between seed and plant. You could never guess what a tomato would look like by looking at a tomato seed. What we plant in the soil and what grows out of it don’t look anything alike. The dead body that we bury in the ground and the resurrection body that comes from it will be dramatically different. About three years ago I was in a meltdown during planting season. It was the middle of June and I hadn’t done anything. There sat my 3 4-foot-by-4-foot boxes: empty. I knew I had no strength to accomplish anything, to plant, but I needed something. I planted a purchased tomato plant in one. One had 3 green bean “volunteers” coming up, so I just put a trellis in it (seeds from the previous year had gone into the soil and were growing with no effort on my part) and I found a zucchini seed or two in my produce drawer in a little baggie and popped those in to the final garden square. They filled my three boxes. They actually looked beautiful and tended to. They grew though I was barely functioning and every single day they gave me the hope I needed that normalcy would return and I would grow past the place I was in. Every day a new leaf or flowering would appear, I knew I was another day past the sorrow – that life would happen again. NOTE TO SELF: I am not behind, either. 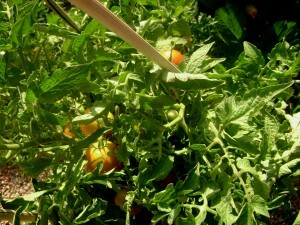 pictured: scouting out last year’s tomatoes one evening…I spy! Jeanie, I love your gardening blogs. I am going to try tomatoes in large pots this year. 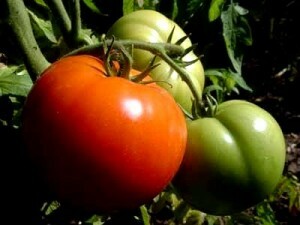 I hope I am successful, I can already taste the wonderful flavor of home grown tomatoes. Maybe I’ll try one or two other veggies. You give great advice my friend. O goody! You should! The great thing about pots is that they can “chase the sun!” You can move them and adjust them and they get the best of all worlds!